The 135kg: That is estimated radioactive materials of FUKU-ICHI which is 168 times of the HIROSHIMA. The 5%: That is fallout to the Japanese land side portion of the 135kg. The 94%: That is still left in the FUKU-ICHI broken furnace which might explode by next aftershock. The 0.4μm: That is estimated average diameter of the scattered radioactive particle from the FUKU-ICHI. This proverb is a translation of Japanese proverb; ”覆水盆に戻らず which means “Water spilled from tray never returns onto the tray again.” When we consider the fine particle size; the 0.4μm, we understand difficulty of collection of all scattered from throughout Japan. An accident occurred on March 11, 2011, then almost Fukushima prefecture was in “Radiation controlled area” then inhabitants should live in the area lived inside of off limit area set by law. Safety regulation was revised for adapt to the environment by the government. The law prohibited except for special people, the general public will not be permitted to enter the “Radiation controlled area”. The inside in the range of the yellow of the above figure was less than 30,000 Bq as of Oct. 2011. Then 30% of Kanto districts, whole Fukushima pref., around 50% of areas of Chiba, Tochigi, Gunma pref. had become the “Radiation controlled area” those are area equivalent to 40,000 Bq at the time of the accident. How to remove it to the safe place? Government method is shown on picture, in brief, that is to burry radiation materials into the underneath of soil where we cannot see. This method is having difficulties to execute now. Final disposal place is not found to begin decontamination. Government is trying to find limited period storage place, even it cannot be found. Then it is the situation that it is kept three years in the temporary dump area. 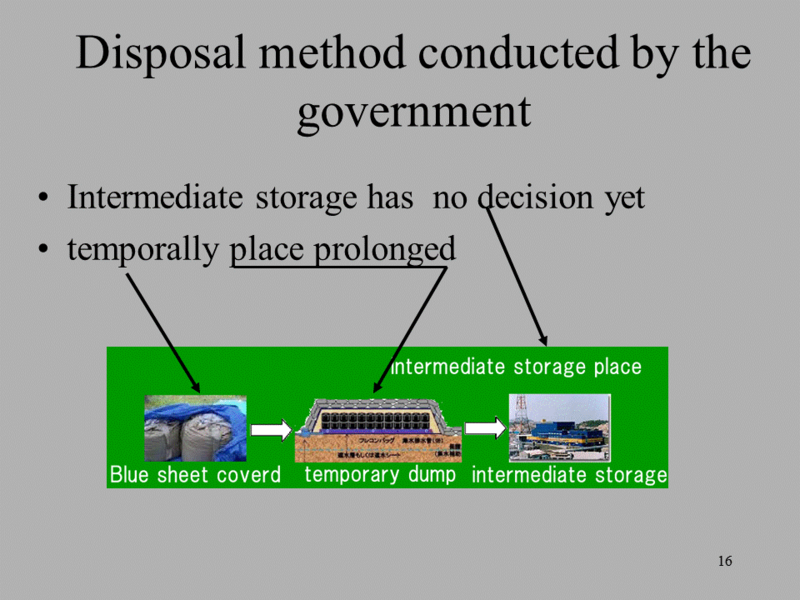 Why we cannot the selection of the intermediate storage location is because there is no final disposal site. Intermediate storage location becomes a final disposal site in the end. Anyone does not want to have a final disposal site in own area. As a result, the temporary storage area which thought about the safekeeping of three years is used for a long time, and diffusion to environment is worried about. They made 800 hundred above mentioned style temporally storages at that time, but half of them are not retrieved now. Anyone does not want to memorize bad accident so they had forgotten them after 25 years now. It resulted in radioactive materials return to environment again. The first merit of this project is that there is managerial perpetuity. Current storage method of radioactive materials is basically to bury in underground, but who can guarantee until one million years when radiation will be safe level. The second merit is due to integration of decontamination and reconstruction. Total transform cost and time will be small due to elimination of duplicate administration. The third merit is reliability which is caused by network comprised from many units, so there is small damage by disaster. It needs one million boxes when we will take off 5 millimeter thickness soil which radiate 5 mSv/h. 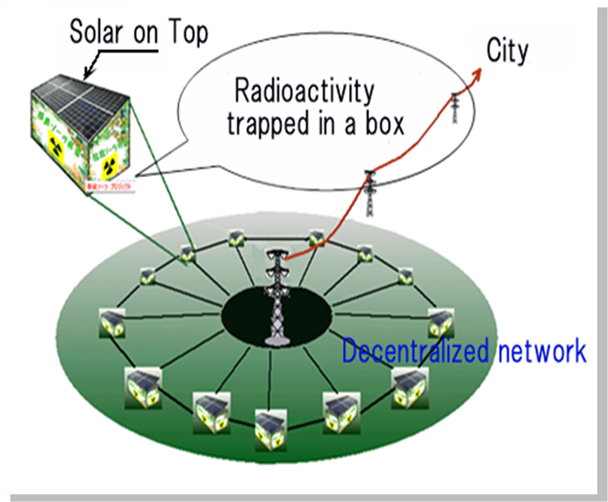 Each solar unit on a box generates 2KW, then electric power will be 2 mega watt in total which is equivalent to lost power by the disaster. The fourth merit is to get storage place easily. The storage is to be power plant, so it makes money, that resulted in neglecting of negative image. Then the storage place will be got and not forget administration of the radioactive materials due to visible control. The fifth merit is elimination of discrimination. The atomic fundamental law generated discrimination between urban and sparsely local people. Decontamination work will be done by urban people’s volunteer labor, it makes local people’s gratitude to urban people, then discrimination will be gone. By performing the construction power plant together with local people and urban people, urban and local bonds is to foster, prosperous society without discrimination is born. When the decontamination solar project could be done, and solar energy will replace the nuclear power lost by the 311, we are still need the crying. Because there are still radioactive materials almost in forest and ocean, and possibility of the 94% left fuel explosion. This is inconvenience truth of the world. What should we do in this inconvenience world? Yuji Miyake lived in Yokohama. Professional engineer. Worked development of atomic power generation maintenance robot. Thank you for sharing valuable your ideas with us. It is amazing the measures that we have to go through to come to terms with something Chernobyl or Fukushima Daiichi. As someone who studies engineers and engineering education, it is apparent to me the specific range of skills and professional strategies that you have brought to this problem. The proposed solution is thoroughly “sociotechnical” as we would say within the field of science and technology studies. I am also very interested in the rhetorical strategy that you propose, which is to very directly tag the nuclear-contaminated material storage units with positive environmental connotations through the use of solar panels and social energy. I guess the question is about how to get communities to “take title” to nuclear waste, and to also politically and geographically distribute this burden in the name of environmental justice. Your rhetorical construct also extends to the idea of energy self-sufficiency, and as a political and economic alternative to nuclear power. Am I correct that from a cost standpoint, there is an appeal to public sentiment and public funds, or is the solution cost-competitive with nuclear energy (taking into account the added costs of nuclear remediation)? Your question is just hit an important point of the project. Government is doing decontamination work and energy transfer independently. Energy transfer is going successful particularly in solar energy comparing wind and earth heating power. Solar power plant is under construction in cheap land area. for example abandoned field due to poor productivity. Decontamination is duty compensating work for government , so that is out of feasibility. But there are problem in this decontamination, because no final disposal area can not be found. Solar business is starting several place excluding radio polluted area even though the area is cheaper land. Decontamination has stopped and several temporally storage are having risk for using over designated life, so the temporal storage could leak pollution to environment after defined period. 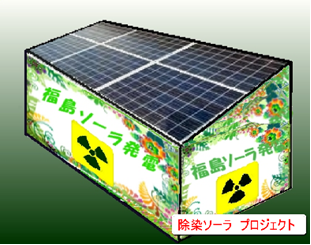 The box of the project gives renew benefit from electric cost sold, so life of the project is continued forever.Then final disposal area is not necessary. solar business point of view, top of box space is cheaper than abandoned field, then the business prefer box top than the field. The box integrates solar and decontamination in one system, then double overhead is escaped, and no final disposal area is necessary and short construction period. That results in cost competitive.